Through a special arrangement with Onesti Entertainment, we just received a VERY special Forgotten Hits Ticket Discount Offer for tonight's show at The Arcada Theatre! Simply mention Forgotten Hits at the Box Office and you will receive a 25% Discount off the ticket price for every ticket you purchase! 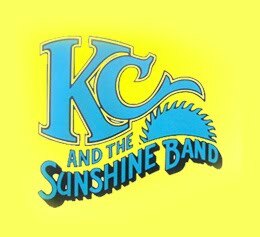 We saw KC and the Sunshine Band there a couple of years ago and they put on a VERY entertaining show ... you won't be disappointed. And, if you ARE able to attend the show, be sure to email us with a full report! Here's the token reminder I always send out the week of my gigs. In this case it's actually not a gig, it's the first-ever public screening of the Paul Surratt film BOB LIND Perspective. If you don't live in the area and can't get there, don't slash your wrists in despair. The DVD is available for sale at the cheapo-cheapo price of 20 bucks. DVDs will be on sale for a one-time discounted price of $15. Bob will also autograph them. The last time Buffalo Springfield played a public show was in 1968 (they once performed privately at Stills' house in 1986). There was talk of a reunion tour, but Young wasn't interested. Subsequently, Martin and Palmer brought in other members and toured as Buffalo Springfield Revisited. 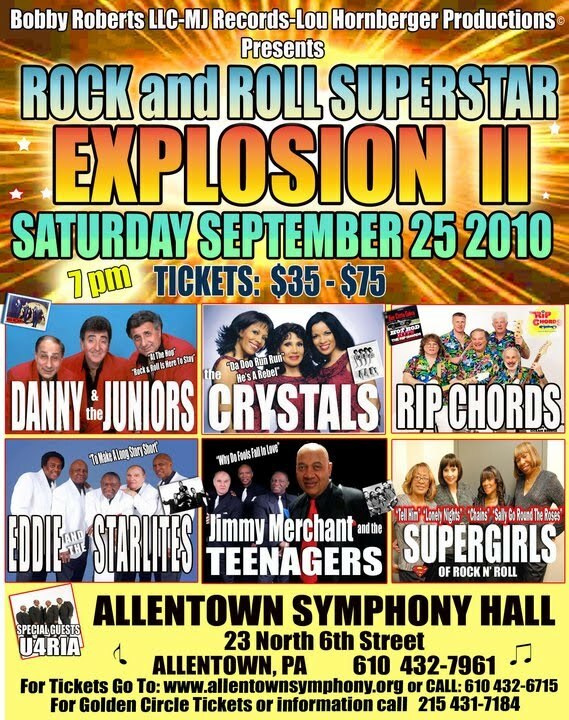 We're included in a great show this weekend at The Allentown Symphony Hall in Allentown Pa ... Saturday, September 25th. And don't forget Micky Dolenz is coming back to the Chicagoland area in October, sharing the bill with Peter Noone at The Star Plaza in Merrillville, Indiana. (We recently gave away a pair of tickets to a lucky Forgotten Hits Reader!) That's a show we're really looking forward to! COME AND DANCE, SOCIALIZE, CELEBRATE A BIRTHDAY, ANNIVERSARY OR JUST GETTING TOGETHER AFTER WORK FOR COCKTAILS. YOU'RE WELCOME TO BRING SNACKS. LIVE ROCK 'N' ROLL ROOTS MUSIC OF VINYL COVERS AND THE DEL SOULS. AWARD TO THE BEST SHAKE, RATTLE AND ROLLER!!! My question is why? Wouldn't it be a better idea to get Jerry Lee Lewis as a guest, since he's the only member of the quartet still alive. I'm not sure what this is all about ... having just recently seen this production, I know that there is a significant female lead to the story ... but it looks like Elizabeth Stanley will still be playing that role for this special performance. (Maybe Lesley's gonna do a walk-on as Sam Phillips' Grandmother or something!) Hey, it'll be GREAT to hear her perform a few of her biggest hits ... and, as a "special encore", it should be a real treat ... but what ANY of this has to do with ANYTHING related to "The Million Dollar Quartet" is beyond me! She would have been all of about ten years old when this studio event took place. Put us back on the list! Where we're all keeping the oldies alive! My dear Friend and fellow Fargo, ND native, Bobby Vee, along with Brian Hyland, and the Shirelles will be at our Big Classic Car show this Friday night. It will be Rockin'. Meanwhile, here in Chicago, we've got Matthew and Gunnar Nelson coming next month with their tribute to THEIR father, Ricky Nelson. (We've heard really good things about this show ... a couple of our readers caught this tribute when it played out on the East Coast ... Gunnar Nelson was on the air with Jeff James the other day on Y103.9 and explained that it's a two hour show jammed packed with Ricky's music ... along with video clips from various stages of his career ... sounds like you'll be able to watch Little Ricky grow up right before your eyes on the big screen backdrop, featuring HUNDREDS of Ozzie and Harriett video clips! Tickets are still available for this show, too, at the Arcada Theatre on October 1st. Be sure to visit their website for more information. I have had an amazing summer and have not been in contact with you all for a while. One awesome event this summer was a live Radio and U-Stream broadcast from Rock Con at the Meadowlands in NJ. Now the fall is here and this Halloween I will be in Indiana with some of the greats of music history ... Diamond Dave Somerville of the Diamonds, and Marshall Lytle of Bill Haley's Comets for the Rewind Monster Jam Sock Hop. If some of your readers are in the area and plan to come out to see the show, please let me know by e-mail. (My e-mail is JayJayDJ@aol.com and now with over 10 million hits on my web site www.RewindShow.com )I will also be in Indiana this Sunday, September 26 - 30, for concert promotion personal appearances. I am attaching the poster for the Monster Jam. The season just started and we're already talking about the Super Bowl. Off the wall question: The (lovely) girl who appeared on The Knack "My Sharona" 45 picture sleeve is actually the real Sharona Alperin, the song was written about? John Yep, it sure is ... and I imagine that provocative sleeve helped to sell a few copies of this single all by itself, even if you hadn't already heard a catchy note of this monster hit record! Trade Martin put out several 45's while he was at COED. One of my favorites is "Hula Hula Dancing Doll", which got a fair amount of airplay on WBZ. Sadly, (to me anyway) the only TM song that shows up on CD is "That Stranger Used to Be My Girl". It's also a great song, one of the few Top 40 songs featuring a tuba, and does show up in stereo! Are there any Trade Martin collections avaliable, or planned? I've always enjoyed Trade's song "Hula Hula Dancing Doll" ... have played this one before on Topshelf Oldies! Sending along a couple of others, as well ... Lucky Boy, Happy Girl, Lonely Me, and his version of Hot Diggity, which I have up on YouTube as well. Please thank Phil for me. You know, I do plan on eventually releasing a collection down the road (maybe this Spring or Summer) ... and I'll include most and maybe even all of my Coed, RCA, Toot & Buddha releases. I've noticed the Hula Hula Dancin' Doll 45 on Ebay a number of times in case Phil is interested. I've got one somewhere in my files. It's always nice to be remembered in a positive way. THANKS AGAIN Kent & Phil!!! Please check my YOUTUBE audio-visuals. Since nobody has mentioned the man who wrote those lyrics and recorded the first vocal version, I will. He is the late Oscar Brown Jr., long associated with jazz and adding lyrics to jazz instrumentals. Knowing you to be a completist, I am sending you his version. There is more at that link than you could possibly use but you might find it interesting reading. What am I missing here? There is a DVD (finished or still in the works?) about The Wrecking Crew. I really can't wait to see it. I see it is being screened here and there, but it is not yet for sale. Apparently they are trying to raise more money for it? Why don't they just sell it and get the funds back from sales? I'm usually on top of these issues, but here I am at a loss to explain this plan. What am I missing? Here's an update from "The Wrecking Crew" film producer, Denny Tedesco, whose father Tommy was one of THE key members of this studio artistry! Even though we've won awards all over the world in festivals and have garnished amazing reviews, the 'industry' doesn't take kindly to music documentaries. They feel there isn't a market for it. Obviously, we feel differently ... and audiences in 50+ festivals will also contest this point of view. The record companies and publishers are not the 'bad guys' in this. There are no bad guys. They have made amazing deals but we have a $250K nut to crack with music and stock footage licensing. Once the licensing is paid for we'll be able to release the film and DVD. So now we are working through the International Documentary Association which helps documentary film makers as a 501C. We are able to receive donations through the IDA and donors are given a charity tax deduction. When the donations come in, we start knocking down the bills. We created a whole donor section that shows how folks can donate any amount. Donors have donated from $5.00 to $5000.00 from all over the world. We are coming up with all kinds of ways of raising funds. We are now having concerts and private screenings as fund raisers. It's donations only. We have had it in a library, living rooms and museums. Even though we haven't released the film, I am still interviewing crew members and artists of the era for excerpts of the film. We have shot Al Jardine, Peter Tork, Petula Clark, Richard Carpenter, Jackie DeShannon, and many more. Every few weeks, we keep releasing out-takes on the web-site. Our goal is to show a distributor or investor that we have the audience that is ready to buy as soon as it comes out. The blogs and web-sites like Forgotten Hits have helped us tremendously. It keeps us going. Our biggest hurdle is to remind people that WE HAVE NOT BEEN RELEASED! Thanks again for your support over the years and hopefully something will happen very soon. This is Liz from New Jersey. I'm the person who was looking for "Cheek to Cheek" ... by The Percells, not Fred Astaire ... and I can't thank you enough for finding it for me! I literally searched for it for years and I hadn't actually heard it in well over 40 years. When Mr. C sent it to me, I listened to it over and over again, with an ear-to-ear grin on my face ... it brought back wonderful memories of youth, being relatively carefree and, of course, first love ... the worst case of puppy love the world has ever seen. I've slowed down just a bit on listening to it, but am still enjoying the heck out of it! Thanks so much again ... and please pass my thanks on to Randy Price for identifying the song for me and Tom Diehl, who I believe was the person who provided it. How great that they shared their knowledge and the song ... and caused someone they will never meet to have a really great day spent grinning ear-to-ear while listening to an old-time favorite. >>>I'm trying to find out anything about a really obscure track that got minimal airplay out here in Melbourne, Australia, around 1965. I don't even know the title but its refrain went along the lines of - 'We're not movie stars, We're just the boys with the big guitars.' (Ka-Chang!!!) I always felt that it might have been a Boyce and Hart song ... does it ring any bells with you? Maybe I'm looking for something that's so obscure that its only in my memory banks, however I recall the song as being sung by a duo with a name reminiscent of Boyce and Hart. I do recall talking to other kids at school about the track and there was a general consensus that it would be a hit. Guess we were wrong about that. There also may have been a clip shown on local television in Melbourne Australia, and again my guess is around 1965. Any info would be great. >>>This was issued in Australia, on W&G WG-S-1948. It was also issued in America on the Ford record label. Chip Taylor and Ted Daryll were the Town and Country Brothers and the song is called The Boys With The Big Guitars. Thanks Kent ... and thanks too, to Tom, for his help this has been a wonderful discovery. Once I found that out, I was able to discover that The Town and Country Brothers had a reasonable sized hit here with another track, Sandy, Sandy ... it's my guess that Boys with the Big Guitars was to be the follow up. Once again fantastic help you've provided me, so please put me on the list. I've attached a small image of some of my archive ... might be of interest? When I was 13 in the summer of 1965, my friend Art and I built a "wireless broadcaster" out of some radio parts we bought at the Six Corners Olson Electronics, all screwed to a piece of scrap 1 X 6. We hooked it up to his shortwave listening antenna (about 30 feet of wire strung from his house to his garage) connected it to his record player, and grabbed a 45 from the pile of records he had just sitting on a basement shelf. Then we took a transistor radio and ran around the neighborhood seeing how far away we could hear it. When the 45 ended, we went back to the basement and put it on again and then ran in the other direction. You could literally hear it a block away, west past Overhill and east past Oriole. The 45 was "Rocket Ride," but it was not (obviously) the 1978 Kiss song, nor the 1963 doo-wop piece by Johnny Greco. It was a pounding instrumental, all drums and guitars, and so up-tempo it was borderline manic. I have no recall of the artist, and think it may have been a B-side. I just don't know, but it was a fun stunt and I've always wondered if anyone else in the neighborhood swung past the frequency then and heard it too. I'd love to know the artist, and certainly hear the song again if anybody has it. Here are some of your Summer Countdown Comments that we received after last week's feature ran on the website. More draggin' than surfin' in Chitown! Thanks for printing the lists. It's fun and sure takes me back! I was amazed by how many local 1964 hits weren't on the national list. I was also amazed by how few songs on the 1963 list were ones I want to hear today. I would say there were only 15 I still want to hear. I think part of it is because the songs were actually pretty awful but I also think that I don't want to hear many of them because they've been played over and over again on oldies radio. I especially think this because when I looked at the ones that only made the local chart I said to myself "Wow, I haven't heard that one for a long time!" and would love to hear them again on the radio. Frankly speaking, I rarely listen to oldies on FM anymore except for the weekends when Scott does his forgotten oldies or fantastic remake shows. I listen now to XM / Sirius, whose playlist must be at triple the FM stations and include lots of songs that I haven't heard for 40-50 years or never heard at all. Thanks for keeping the oldies alive Kent! Just curious how "I Will Follow Him" by Peggy March would qualify for a Top 50 hits of Summer when it comes out in March? Nothing wrong with the song, but it's not from the Summer! Another curious choice that makes me wonder what the criteria is for a “Summer” Song? Curiously “A Summer Song” by Chad & Jeremy doesn’t even make the list even though it’s probably one of the top late summer classics of ’64, and “Hello Dolly” by Louis makes the list even though it’s released in January!! I don’t get this. The lists were compiled based on points earned during the months of June, July and August ONLY for each given year. On a national level, all three major trade publications were consulted ... Billboard, Cash Box and Record World ... thus creating, in effect, our "Super Chart" that we have talked so much about these past few years ... I don't know that there could be a more accurate ranking of this music other than a compilation of these three sources ... at least on a national level. Locally, depending on the year in question, we used the surveys distributed by our two AM Radio Giants, WLS and WCFL or (in the case of 1963, 1964 and 1965, which was BEFORE WCFL became a Top 40 Radio Station), a widely circulated "street sheet" called simply Top Tunes Of Greater Chicagoland. Assigning points to each Top 40 Record on each list, we then calculated each record's strength based solely on its performance during the Summer Months of June, July and August. In the case of "I Will Follow Him", yes, it first charted in late March of 1963 ... but it stayed on the charts for 14 weeks ... so any points accumulated in June would have been from the end of its chart run ... and apparently that was enough to make our national list. (Quite honestly, it didn't chart very high ... it was the #50 Song of Summer '63!) Notice, too, that it didn't make our local list. I love these summer look backs. It just so happens that I'm making my soon to be 18-year-old Son a disc of tunes from the year 1966. Thank goodness I still have my vinyl. It's interesting to me that the midwest does seem to have a different taste than the national charts. When I look at the Chicago lists, they are much more reminiscent of what I heard growing up in North Dakota. Sting Ray was one that I heard a lot. How do I find the archived summer charts for 1967 - 1969? Thanks for these lists -- they bring back great memories. I certainly was cut from a different cloth though, as I was buying not only Beatles, Four Seasons and Beach Boys, but lots of Motown, Little Anthony, tons of R&B (Irma Thomas, Jimmy Hughes, Drifters, Gene Chandler, Major Lance, Impressions, Soul Sisters, Exciters, Tymes, Garnett Mimms, James Brown, Sapphires, Willie Mitchell, Jerry Butler, Solomon Burke, B.B. King, Jackie Ross, Ovations, Lenny O'Henry, Patti LaBelle & the Bluebelles, Sam Cooke, Ray Charles, Tams, Bobby Bland, Chuck Jackson, Rufus Thomas, Walter Jackson & Otis Redding), any Phil Spector stuff, still buying Elvis and even Gloria Lynn, Frank Sinatra and Los Indios Tabaharas. Believe it or not, by the end of '64 I already had about 10,000 records of which about 1,500 were albums. By the end of the 60s I was up to around 60,000. I hit my peak in around 1995 with almost 155,000. Thank God I never fell for 8-tracks! Keep up the great work -- this sure has mushroomed for you, hasn't it? Peter Noone learned the song from his Grandfather who sang it while standing on the piano at family do's. As you can imagine, the state that created his confidence to sing / stand on the piano also created an inability to remember more than one verse. Therefore, Peter only fully learned the first verse.Which, in 1965, didn't matter because the "second verse ... same as the first" gave the song notoriety and my father a headache, every morning hearing it on the radio while driving to work. One of the biggest songs of summer, 1964 was "First Night of the Full Moon" by Jack Jones ... with a tune, large portions of which, were appropriated from Pearly Shells, of all things. The biggest hits of summer, 1965 and no "Liar, Liar" on the list? Sheesh! Your observations on the 1963 summer charts are very informative and quite accurate. Shut Down by the Beach Boys was a big hit in a LOT of cities and charted high in many markets. Del Shannon's From Me To You also had a lot of airplay. The other songs you listed, such as Hootenany by the Glencoves (Select Records, part of Joy), Sting Ray by the Routers (WB), Tamoure by Bill Justis (Smash) and I'm Afraid to Go Home by Brian Hyland (Am-Par) were all played in a lot of markets including WKBW in Buffalo. The flip of the Brian Hyland song is "Save Your Heart For Me", which is the 3rd big hit for Gary Lewis & the Playboys (still have my white promo copy after all these years). Kudos goes out to you and to the others who helped you compile the top fifty songs for the Summers of years in the 1960's. What I found interesting and was looking at mostly, was the top fifty for Chicago. I was interested in seeing what records were big during the Summer locally there as opposed nationally. Personally, I always went by what a record did locally here in OKC than what it did nationally. For example, the year 1970: the Pipkins, Miguel Rios, Watts 103rd Rhythm Band, just to name a few. These are, of course, records I remember with the Pipkins record being the bigger of the three here in the OKC area. In 1966, you had Evol Not Love, Day For Decision, Land of Milk and Honey (one of my alltime favorites by the Vogues). In 1964, you had Farmer John by the Premiers which was recorded live. (Did you ever stop to think that all records were recorded live?) Whether in a studio or club. The Grateful Dead excluded. I have got to be honest with you. From 1963, Bill Justis' record of Tamoure on Smash was not played here. Correction! It didn't make the weekly survey. I was told years ago that just because a record didn't make the weekly radio survey didn't mean it wasn't played on the air. Now in the back of my mind, I knew that Bill Justis recorded for Smash records, but had forgotten all about it. In fact I had to go online and find a video of it to hear it. New one on me. Finally I checked a while ago and you alluded to this in your paragraphs on the top 50 of Summer in Chicago. In the mid seventies, WKY radio here in OKC cut their weekly radio surveys down to just 20 records. Period. There might have been, I repeat might have been, maybe 4 or 5 listed at the bottom as extras. I understand a record had to be a powerful hit to be played and to make the top 20. Some final notes while I am thinking about them. Without going in and playing the original 45 of Hitching a Ride by the Vanity Fare, it seems to me that through the years the radio version's ending is different than the original 45. Likewise, Steppenwolf's Magic Carpet Ride. Also, I could be wrong, but in your comments on Bill Justis, I believe you misspelled his last name wrong. Several of you wanted to pay tribute to The Ides Of March regarding their recent Street Dedication Ceremony ... in fact, we even heard from Jim Peterik himself! First of all, thank you, for devoting your time on honoring the Ides of March. I did see the street dedication for them and it was great ... I really enjoyed it. I can't wait to see the sign when it's up on Home Avenue. Good to see Morton West High again, too! I especially liked the photo presentation on the big screen and the individual stories from all the guys ... they were very touching. How wonderful to have a local group who stayed together all these years. When each one of them spoke, they considered themselves "family". They are not only a good vocal group but good musicians as well. And cheers for Jim Peterik and his talent for writing so many hit songs! Long live the Ides of March! All their songs are great, but "You Wouldn't Listen To Me" is my sentimental favorite. I have it on my jukebox! They may have recorded "You Wouldn't Listen", but evidently everyone did and they have lasted all these years! I went to elementary school and Morton with Bob B and Larry M (Piper School) and to High School with Jimmy (good friends with my sister Laura in his class). EYE have a copy of the Shon Dels' "Like it or Lump it" !! I WAS VERY PROUD TO HAVE BEEN THERE TO SHARE THAT SPECIAL MOMENT WITH MY ROCK N' ROLL FRIENDS AND ADD A FEW MORE VERY SPECIAL PIX TO MY COLLECTION ... CONGRATULATIONS, IDES BRETHREN, IT WAS AWESOME!!! The Ides of March give the best show bar none of the working 1960-70 Chicago area groups I have seen. With the creative force of Jimmy Peterik, the Ides perform all their great hits and all the songs Jim wrote and perforned with Survivor and wrote for .38 Special. Plus the Ides are always re-inventing themselves with original songs they perform. To say Jimmy is a showmen is an understatement and you can tell the guys have a blast performing after all these years. If you see one Chicago group, this is the one! Just wanted to convey my congrats to The Ides Of March on their recent wonderful honor. Next to The New Colony Six, the Ides Of March are my OTHER all-time favorite 60's / 70's band from the Windy City. It's really amazing that after 45 years, The Ides continue to rock with all of their original members intact ... that in itself, is truly a major accomplishment. I was fortunate to meet Jim Peterik back in the early 1980's at the 60's Chicago Band Reunion at the Holiday Inn in Hillside, IL. I had a chance to sit down and chat with Jim at this record convention / band reunion. This was at the time when he was riding high with his stint in Survivor ... I never thought that he would take time with me to answer all of my questions about The Ides Of March, but ... instead of wanting to talk about his then-current Survivor group, he anxiously sat down with me for nearly an hour, and we talked about nothing but The Ides Of March. I was floored that he was kind enough to personally sit down with a nobody like me, and recall the old days with The Ides ... it became immediately apparent that Jim was still very proud of the Ides Of March ... What a great guy! I'm proud to say that I own every "promo" copy and "store-stock" Ides Of March 45 on Parrot, Kapp, Warner Bros. and RCA, along with all of The Ides albums on W.B and RCA. I even own a copy of the hideously-rare Shondells (pre-Ides) single titled, "Like It Or Lump It' on the Epitome label ... mow, how's that for being a "die-hard" Ides Of March fan?? Anyways, congratulations to The Ides Of March for this fantastic honor! ... They REALLY deserve it! Wasn’t that awesome of Berwyn to recognize their home boys and a fine bunch of guys to boot? Jealousy and envy aside, lads, this honor could not have been bestowed on a finer group of guys. Thanks for your great music and heavy competition for airplay and chart position in the day and your friendship ever since. Blessings to you and yours; kudos from Berwyn and your countless fans, myself among ‘em, are truly well deserved. I cannot tell you how much I have enjoyed the Ides of March (and Jim Peterik's) music over the decades! When I was able to meet Jim and talk with him personally in 2006 (courtesy our own FH member Marlene) for awhile before their concert, the guy was just so nice and remembered all the obscure stuff I wanted to talk to him about in the 60's. It was so cool. The Ides deserve their own street in Chicago! They helped pave the way just as the Cryan' Shames, New Colony Six, Buckinghams, Mob, Styx, Chicago and so many others did in their own way! How about streets for them too!! Story has it, the guitar solo on the "hit" take version of Vehicle was damaged, but the recording people managed to splice in a previous take portion!!! I hadn't heard that story before, but since Peterik has probably played that riff 40,000 times since, I wouldn't think it would have been all that big a deal to splice in a quick fix! In the liner notes to the Limited Edition Rhino Handmade CD "The Ides Of March - Friendly Strangers: The Warner Brothers Recordings", Jim Peterik told Bill DeYoung that the "Vehicle" album was recorded at CBS Studios in Chicago, which had previously only been used for radio and television voice-over work. "They didn't know rock 'n' roll from a hole in the wall," Peterik said. "They did a good job but it was a learning curve. We were all learning together. "I remember that kind of feeling of experimentation. I also remember 14 seconds of the master of 'Vehicle" being erased! We were doing background vocals and suddenly 14 seconds were gone from the master! No way to retrieve it. The second engineer had hit the wrong button. We spent two hours thinking 'Our career is over!' because at this time we knew we had something. Enjoyed the post on the Ideas of March dedcation - Well done Kent! In the early 70's, promotion man Bob Destocky (sp?) and Frankie Rand begged me to add "Vehicle" to the WLS playlist. It would be the very last record that, as program director, I would make "Pick Hit of the Week" ... giving it airplay every hour for the first week. I was on my way to Los Angeles to become president to Bill Drake's company but within a few weeks Vehicle was all over the airwaves in Los Angeles as well as Chicago and the nation. A great record ... and a great band. I'll be doing Michael Stock's FOLK AND ACOUSTIC radio show this Sunday, September 19th, sometime between 2 p.m. and 5 p.m. 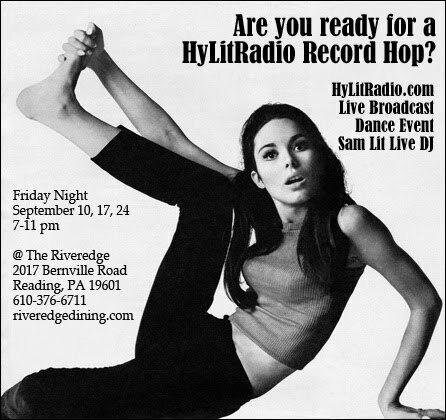 Tune in and listen to me shamelessly hawking the screening of the brand-new documentary: BOB LIND Perspective. If you live in South Florida, you can hear the show on WLRN 91.3 FM. The first-ever public showing of the film will be at THE CENTER FOR SPIRITUAL LIVING in Boca Raton. MPL and the Concord Music Group are pleased to announce the re-release of Paul McCartney & Wings’ iconic Band on the Run. Heralded as one of the greatest albums of all time, the GRAMMY winning, smash # 1 album - originally released December of 1973 - yielded the immortal title track and world-wide hit “Jet” becoming Wings’ most successful and celebrated album ever. Paul personally supervised all aspects of the Band on the Run reissue. The remastering work was done at Abbey Road using the same team who recently remastered the complete Beatles’ catalog. Band on the Run will be available in a variety of formats originating with the single disc digitally remastered, essential 9-track standard edition. The 3 disc (2 CD, 1 DVD) special edition features nine bonus audio tracks (including the top 10 smash “Helen Wheels”), rare footage of the McCartneys in Lagos and behind-the-scenes at the famous album cover shoot, original Band on the Run promotional video clips, the One Hand Clapping television special (highlighted by studio performances filmed at Abbey Road in 1974) all with beautifully enhanced packaging. The original remastered album and bonus audio content will also be issued in a 2 disc 180gm audiophile vinyl edition that comes with an MP3 download of all 18 tracks. Lastly, the standard and deluxe versions of Band on the Run will be available digitally worldwide. The musical achievement of Band on the Run is nearly matched by the amazing story behind its creation. Intrigued with recording abroad in the summer of 1973, McCartney searched for a list of studios around the world. Spotting one in the remote location of Lagos, Nigeria, he became enthralled with the idea of recording in Africa. Days before departure, lead guitarist Henry McCullough and drummer Denny Seiwell quit the band, leaving the entire project to the three core members, Paul, his wife Linda McCartney and band-member Denny Laine (along with recording engineer Geoff Emerick). Recorded in August and September of 1973 (with further work done at AIR Studios in London in October 1973), they persevered through a tumultuous, yet creatively invigorating two month recording process, battling difficult studio conditions, oppressive heat and a dangerous mugging at knife point. The thieves made off with the demo tapes (among other valuables), forcing the band to record the entire album from memory. Paul is currently playing five songs from the album on his ‘Up and Coming Tour’. Live favorites over the last 8 years of touring have included “Jet”, “Band on the Run” and “Let Me Roll It”. In 2008 when Paul played a free outdoor show to over 500,000 people in Kiev, a Ukrainian poll listed “Mrs Vandebilt” as their all time favorite Paul McCartney song. It’s been included in the set ever since. At the start of this tour Paul added “Nineteen Hundred and Eighty Five” to the set. Band on the Run marks the first release from the Paul McCartney Archive Collection, an ambitious reissue program that encompasses 40 years of cherished, classic material from the most successful songwriter and recording artist in music history. It’s also the initial physical release of the recently announced agreement between McCartney’s MPL and Concord Music Group to globally market and distribute Paul’s venerated solo and Wings catalogue. Wow, the Growing Bolder people just completed a new one hour interview with Roger McGuinn and his adorable wife Camilla. The first two segments are on video the entire interview complete with music is also attached. Just a great story with great music. Please check it out and ENJOY! As many Criterion fans are surely aware, the cult film Head, starring The Monkees, will soon be released as part of the box set America Lost And Found: The BBS Story. Preceding this cinematic bonanza by a month, Rhino Handmade will be releasing an expanded 3-CD edition of the film’s soundtrack on October 26, chock-full of previously unreleased goodies and rarities. By 1968, The Monkees’ TV series had been canceled, and Head was conceived by Rafelson and co-writer / co-producer Jack Nicholson to explode the band’s clean-cut, safe-for-all-ages image (guitarist Mike Nesmith — the one whose mother invented Liquid Paper and thus had enough money to skip every Monkees reunion of the last thirty years — has stated that Rafelson and Nicholson intended to “kill” the band for good and all). The movie pretty much did the trick: after its November 1968 release, The Monkees had been largely written off, and indeed began disintegrating as a band shortly thereafter. Regardless of what one may think of the film, however — and the opinions may soon beflying hither and yon on THAT topic — the soundtrack album is pretty catchy. Assembled by Nicholson, the Head album is a somewhat unique collage of songs and dialogue snippets from the film spoken by band members (“I’d like a glass of cold gravy with a hair in it, please”), several performers who made cameo appearances such as Victor Mature and Frank Zappa, and seemingly random citizens of the world (“Are you telling me that you don’t see the connection between government and laughing atpeople?”). I say “somewhat” unique because the album is clearly influenced by Zappa’s mindbending 1967 album Lumpy Gravy, which was even more daring in its avant-garde, seemingly haphazard collage of rock, orchestral music, strange sounds, and improvised dialogue from a group of people who live in a piano. You heard me. The songs are a solid lot, from Peter Tork’s psychedelic “Can You Dig It?” to Harry Nilsson’s rollicking “Daddy’s Song”, from Nesmith’s burning rocker “Circle Sky” to the absolutely sublime “Porpoise Song (Theme From Head)” — written by Gerry Goffin and Carole King, authors of such pop classics as “Will You Love Me Tomorrow” and “TheLoco-Motion” — which is arguably one of the loveliest songs The Monkees ever recorded. And, in spite of the band’s desire for more control over their music, these songs were recorded with the assistance of some of the finest musicians lurking round Los Angeles studios at the time, including Jerry Scheff (bass player for Elvis Presley’s TCB band), Dewey Martin (drummer for the Buffalo Springfield), guitarist Ry Cooder (composer for another Criterion title, Wim Wenders’ Paris, Texas) and Neil Young (not to be confusedwith Young Neil). The deluxe edition of the Head soundtrack has been compiled with the participation of Andrew Sandoval, mastermind of many previous Monkees reissues for Rhino Records, as well as producer of several wonderful Rhino collections such as the recent Big Star box set Keep An Eye On The Sky and the deluxe reissue of Love’s immortal album Forever Changes. Pre-orders commence on September 20 at Rhino’s website (www.rhino.com), and everyone who pre-orders from their website will also get a bonus 7” single (hey kids, remember 7” singles? You don’t? Crap, I’m old). For those who still enjoy physical media, it would be a nice way to support Rhino Records, a label that has produced innumerable outstanding collections of classic rock and pop, but nevertheless were forced to lay off many of their employees last year … and, rumor has it, are expected to lay off more very soon due to the increasingly precarious condition of the major label music industry. Again, for the casual Monkees fan and even for many a die-hard Criterion fan, it may be a bit much — especially at $60 a pop — but for the devoted Head-heads out there, it’s a must. So you better get ready — they will be coming to your town …. LOS ANGELES – Ahead of its time when it was released in 1968, Head has emerged over the years as a cult classic from the psychedelic era. Produced by Bob Rafelson and Jack Nicholson, the surreal odyssey stars The Monkees — Micky Dolenz, Davy Jones, Michael Nesmith, and Peter Tork. While the film did not achieve commercial success, its soundtrack contains some of the quartet’s finest and most daring work. Rhino Handmade expands the superbly strange soundtrack, originally compiled by Jack Nicholson, as a three-disc boxed set that features 21 previously unreleased tracks, outtakes, rarities, and live performances, plus an entire disc containing a rare interview with Jones recorded in 1968 for radio broadcast. All those who pre-order, will receive a bonus 7" that includes unreleased instrumental versions of “Porpoise Song” and “As We Go Along.” The collection comes in a 7" x 7" deluxe box with a mirrored finish like the original vinyl release. Due out October 26, HEAD (DELUXE EDITION) will be availablefor pre-order beginning September 20 exclusively at Rhino for a suggested list price of $59.98. Later this year, the Criterion Collection will release Head as part of America Lost And Found: The BBS Story, a compilation of innovative films produced between 1968 and 1972 by Rafelson and Bert Schneider (cocreators of The Monkees) and Steve Blauner. The BBS Story boxed set will be available on Blu-ray November 23 and DVD December 14. Head features a new, restored high-definition digital transfer (with DTS-HD Master Audio 5.1 and uncompressed monaural soundtracks on the Blu-ray edition). The extras include new audio commentaries by Dolenz, Tork, and Jones, and an interview with Rafelson. HEAD (DELUXE EDITION) begins with the original soundtrack remastered, including “Porpoise Song” the film’s theme written by Gerry Goffin and Carole King, Nesmith’s rocker “Circle Sky,” Tork’s “Can You Dig It,” Jones singing Harry Nilsson’s “Daddy’s Song,” and Dolenz singing “As We Go Along,” a track penned by Carole King and Toni Stern (who later composed the chart topper “You’ve Got A Friend”). Also included from the original soundtrack are bits of dialogue from the film and incidental music conducted by Ken Thorne, who composed music for The Beatles’ film Help! The final disc contains a radio interview with Jones about the album that was issued in 1968 by Colgems as a promotional LP. The disc also includes full tracks and excerpts from the Head soundtrack that were interspersed throughout the interview. Deluxe booklet features new liner notes by Andrew Sandoval and Rachel Lichtman highlighted by brand-new interviews with Michael Nesmith and director Bob Rafelson about Head, in addition to dozens of unpublished color photos. The worst 100 songs list is not too bad as those things go. There are a few decent tunes on it, but the great bulk of the list is indeed horrible. I would take off a couple of the alternative style tracks and put more rap stuff on, which is mostly hideous! Once a Paul Revere and the Raiders fan, always a Raiders fan. If you are interested in having the four hour special that Hoss did on RockandRollHeaven.net, please contact Mason Ramsey and tell him that you would like to purchase a copy of the interview. Thank you so much for posting those two items. Regarding the Buddy Holly Foundation, they've picked eight recipients so far, I'm anxious to see who the other ten will be! Pepsi is listing the Sixties Museum on the Pepsi Refresh America Project at refresheverything.com/sixtiesmueum. You can vote every day in September, that is 30 votes for the museum. If we get enough votes, Pepsi will contribute $250,000 dollars toward getting a building for the museum in the NW suburbs. That means about 300,000 people coming to town, jobs and at least something happening. Please tell family and friends. We need more votes to make the museum a reality. Please vote and help spread the word. They don't make it easy. Go to www.refresheverything.com/sixtiesmuseum. Or you can put sixties museum in the search box on the top of the site. I just voted so it takes you right to the vote spot. Thanks for the support. You aren't the only one who has had problems. Wow, I remember being a card carrying member of Pogo's KIMN Hi-Fi Coke Club in the late 50's early 60's, and I made my parents take me to Zale's Jewlers in Downtown Denver to see him in the snake pit, then again on S Broadway to Pappy Fry Plymouth to see him high atop a flagpole for days! He's the one that inspired me to do a bunch of goofy stunts and break a couple of world records during my radio career ... Pogo will be missed! Pogo Poge would do almost anything to get people to listen to KIMN radio. Sometimes that included setting a world record for sitting on a Ferris wheel. Or spending two weeks in a snake pit with more than 100 snakes, some poisonous, a stunt that put him in the hospital. Poge, whose real name was Morgan Branch White, died of heart problems Sept. 2 in a Provo, Utah, hospital. He was 86. Poge was in Colorado and later in Honolulu during the heyday of disc jockeys doing wacky things to get attention. In 1984, Denver Post television critic Clark Secrest called him "Denver's favorite disc jockey ever." "There was some ham in him," said his son, Steve White of Austin, Texas. "He always had to be the center of attention." White lived in Denver from 1957 until 1964. After moving to Honolulu in 1964, he did amateur theater and appeared on TV's "Hawaii Five-0." When Secrest was a reporter, he was sent out on a slow-news Saturday night to 16th Street by an editor who told him "to see what was going on." Secrest listened as teen-laden cars cruised 16th and 17th streets downtown and "every one of them had their radios tuned to KIMN and Poge," said Secrest. "It was like a gigantic stereo system," said Secrest, of Laguna Niguel, Calif.
Secrest called White "personable," someone "who connected with the kids. No one who heard him ever forgot him, as they did other DJs." White and the snakes were on 16th Street at the dug-out site of a Zale's Jewelry store for 13 days. White was bitten by a water moccasin and was hospitalized because the antidote was given incorrectly, said Steve White. Known for his outrageous costumes, White once bounced on a pogo stick from Denver to Boulder and another time sat atop a flagpole at a South Broadway used-car lot for days. Another time, he broadcast while sitting on a giant block of ice. On one April Fool's Day, he played "Tom Dooley" for the entire day, although at the end of each playing he would announce another number. It always turned out to be "Tom Dooley," said his daughter, Tonya Riches of Murray, Utah. He was a hero to many teens because he gave them advice over the air, according to a 1976 Denver Post story. He also emceed gigantic "sock hops" at Mammoth Gardens (now the Fillmore) that featured some of the era's leading rock 'n' roll figures. In Hawaii, White was a fixture on a popular television show, "Checkers and Pogo" a kids' program that ran two hours after school weekdays. Morgan Branch White was born in Monroe, Utah, on July 25, 1924, and earned a degree in speech and drama from Utah State College. He married Mildred Tanner on June 5, 1951. White was an active member of the Church of Jesus Christ of Latter-day Saints and as a young man, served on a church mission to Sweden. He hosted many events for charitable organizations. In addition to his wife, son and daughter, he is survived by three other sons: Morgan White of Sevier, Utah; Kimo White and Keoni White both of Salt Lake City; his sister, Beth Nordgren of Salt Lake; 18 grandchildren; 17 great-grandchildren; and one great-great- grandchild. I just heard a Tommy James interview on the radio. He said his book "Me, The Mob & The Music" is going to be made into a movie and a play in the next two years. Just saw your website, Forgotten Hits. It was your piece on Cameo / Parkway, Len Barry, etc., that I was especially interested in. I have a website devoted to Cameo Parkway. Perhaps some of your visitors would find it interesting. We would fade away without your site! Most people spent this morning doing the NY Times crossword puzzle. We spent our precious time reading every inch of Forgotten Hits. Your passion, for getting this info out to us is a gift from the heart. Forgotten Hits is our discovery of the fountain of youth!. I LOVE Forgotten Hits. I’m a retired (now in IT) jock from So Cal, but Chicago is my home, so you have probably never heard of me. But Biondi and Doremus got me interested in radio, and I kept it up for 20 years. And then on Wednesday, another edition of our "Helping Out Our Readers" feature. Kots of neat stuff in the days ahead ... so please stop back and visit!